Add Peperoni Pizzeria to your favourites! Peperoni Pizzeria Singapore serves its signature wood-fired thin crust pizza and traditional pastas in a cosy and warm setting. There are 5 Peperoni Pizzeria Singapore outlets in Singapore. Visit Peperoni Suntec if you're in town, or the first ever outlet at Peperoni Greenwood. Want to stay home? Make your orders with Peperoni Pizzeria delivery online, or call 6899 6899. To view the Peperoni Pizzeria menu and to find out about the latest news, visit their website and Facebook page. Peperoni Pizzeria first opened in 2004 and is owned by the highly acclaimed Les Amis group. Peperoni Pizzeria also conducts pizza making workshops for kids. 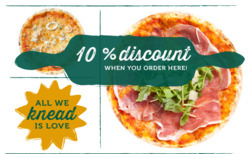 Do you want to receive more offers from Peperoni Pizzeria by email?